Today was a No Fly Day, as any and every person with half a brain would have realised from any and every forecast available on any and every form of media. But that didn’t stop people from turning up at the club, to engage in all forms of activity, such as answering the ‘phone (“No, we’re not flying...”), contemplating tasks on the To Do List (“What are You Doing Here, Go Home..!”) or working through some Bronze ‘C’ subjects, for example what is Buys Ballots Law (a retail form of Brexit? 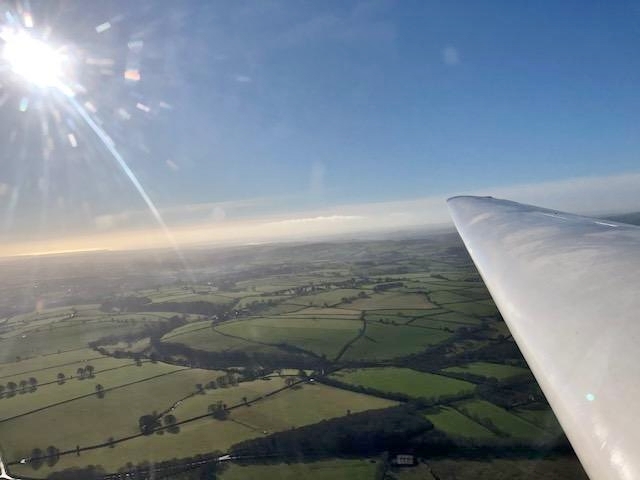 ), why is flying near thunderstorms not a good idea (it gets the elevator wet in the K-13, which then needs drying out - let alone yourself...) or if there’s low pressure over Scotland, which way is the wind blowing over England? (ie. towards or out of the kilt...). With the forecast predicting wind east of south and the winch already positioned at the east end it would have been a foolish set of Sunday Soarers who looked the gift horse given them by the Wednesday Crew (who had changed ends with the winch) in the mouth. The condition of the field was, however, a serious cause for concern as, with the sky clear and mists rising in the valleys, we attended Pete Howarth's morning brief before deciding cautiously to take one K-13 and the K-8 up to the north-west end. First launch was at 1105. 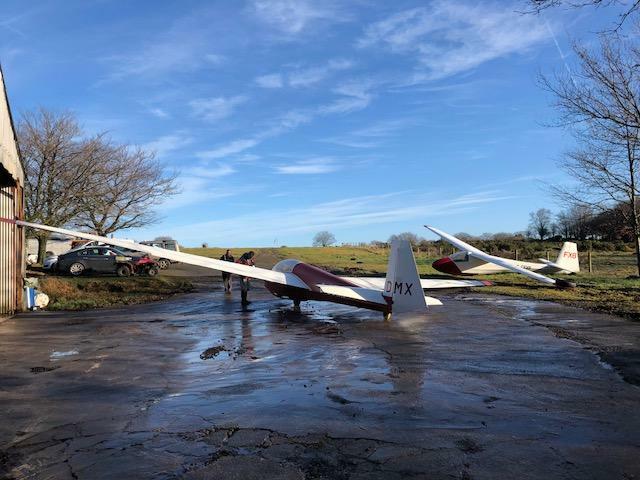 With two trial lessons booked, a F&F and a good number of club members keen to regain/maintain currency, getting through the list was always going to be a challenge, particularly with the going so very soft, but it was nevertheless good to see such a healthy turnout. Roger Appleboom embarks upon his Record Breaking Flight in K-8 FXB. 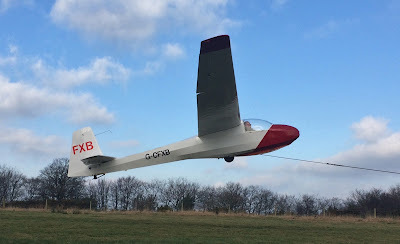 With a light wind and some cumulus indicating wave from the south, whilst strato-cu formed drifts that obscured the sun, there was no clear soaring modus operandi, but that did not prevent Roger Appleboom from achieving a record breaking personal best with his longest flight of the year. It has to be said, however, that his modest 9 minutes in the K-8 was beaten by Richard Roberts, who managed a whole 12 mins (also a PB at BRT) and that we hope these records do not remain standing for very long..! 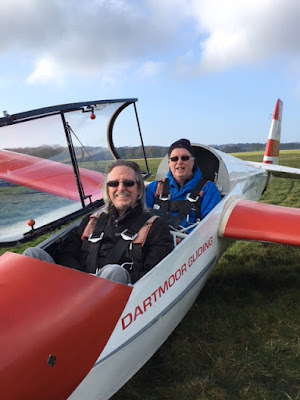 Our visitors were Richard Nally, who flew with Pete Howarth, and Chris Brown, who flew with Martin Cropper. 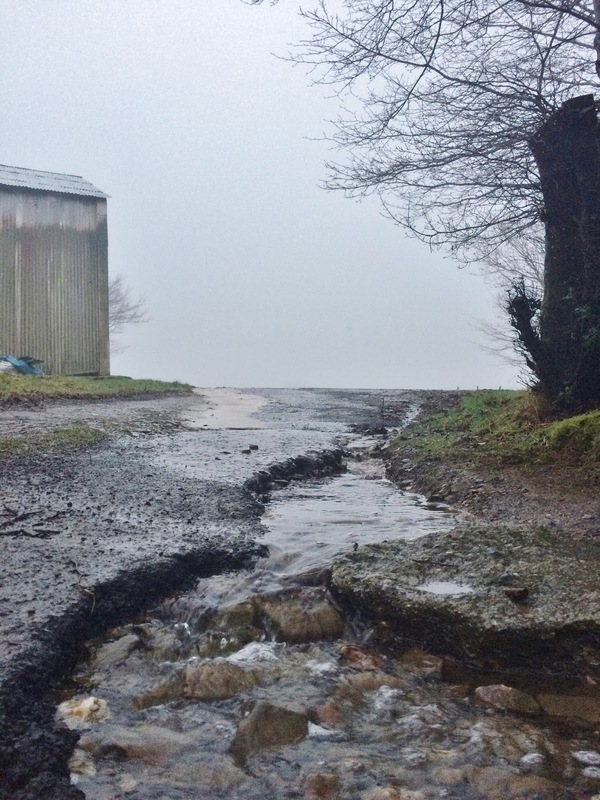 Rich brought his extended family with him (just how do children fail to feel the cold..? ), whilst Chris's flights had been bought for him by his father, who had also flown with us when Chris "were just 'ubbuy'"..! 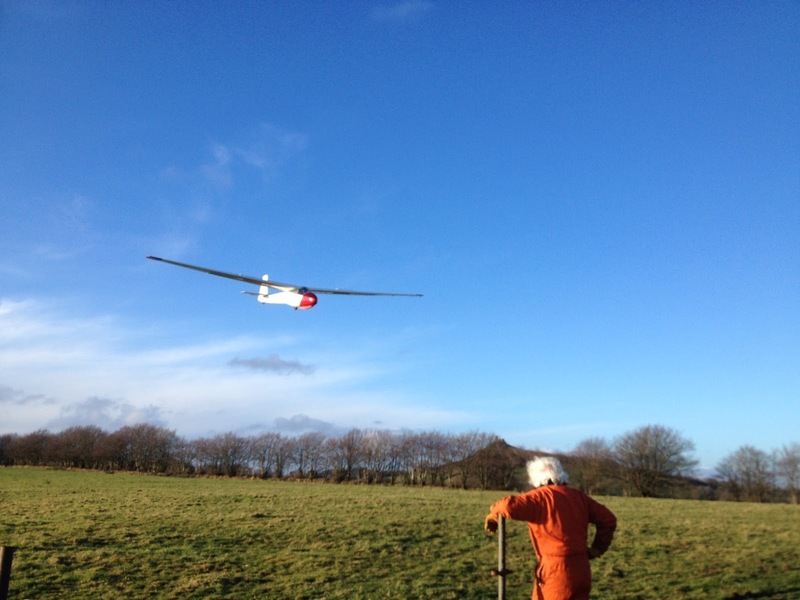 Both enjoyed their short flights and vowed to return. 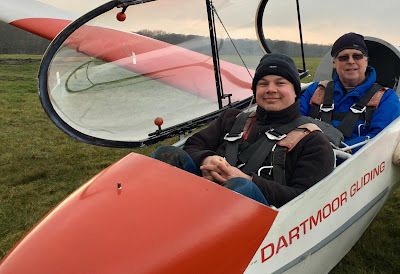 Our F&F was Luke Vitai, the submariner husband of one of Ed Borlase's colleagues at the Theatre Royal who, despite a long and perishingly cold wait, thoroughly enjoyed his induction flight with Pete Howarth and will be back with us as soon as his underwater duties permit. Visitor Rich Nally ready for his flight with Instructor Pete Howarth. Luke Vitai is given his first taste of DGS by Pete Howarth. Stretching the day as long as we dared, it was a little after sunset when the final landing rolled to a halt, and we wheeled the gliders back for a well earned wash down and tucking up in the hangar. 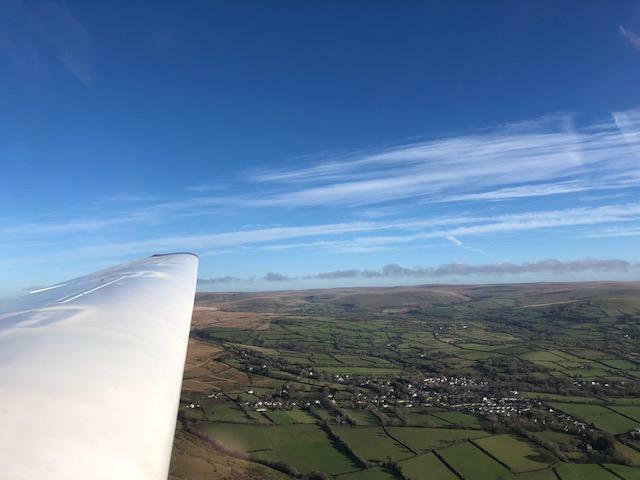 Twenty-two launches, no new defects and some cold, but satisfied smiles on faces bore witness to a productive and successful day. But for how long will those personal best times remain in place - just now they look pretty safe for at least one week, that's for sure..! 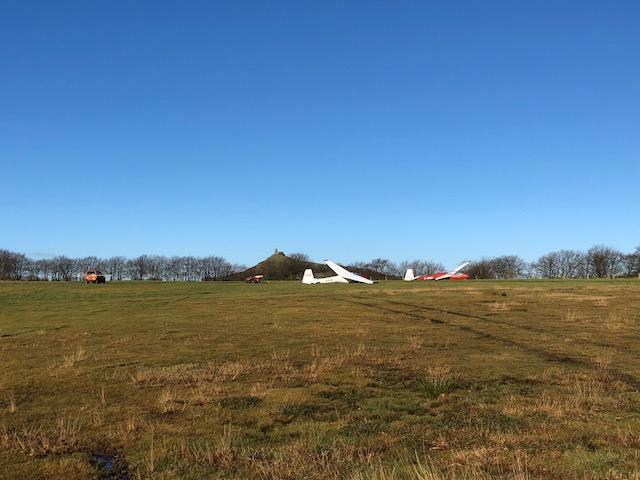 An optimistic weather forecast suggested that there might be the opportunity for some flying today so a ‘who wants to fly?’ email on the Club Google Group was sent out to gauge interest. And so it was on with the flying list with a dozen or so flights then completed in the K13 and K8 allowing pilots to either regain or maintain flying currency. Best flight of the day was 17minutes by Steve Fletcher in the K8 who managed to find a small thermal. With the wind forecast to be in the NE, an hence a possibility of wave there was some anticipation in the clubhouse early on. 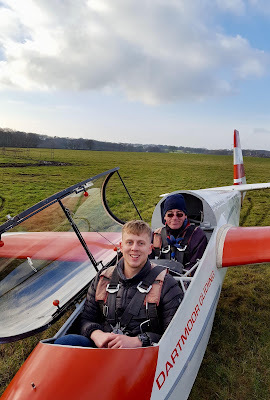 Forecast wind speeds aloft (35kts at 2,000 ft) and gusts in excess of 25 kts at ground level tempered that anticipation, however, as we waited for sufficient members to arrive (which included a welcome visit by Wynn Davies, from DSGC). (Phil Hardwick, Rich Roberts, Leith Whittington, Wynn Davies, Martin Cropper (and Ed Borlase (photographer)). Looking SE the cloud continued in an arc downwind of Blackdown. A 10am ‘stewards inspection’, however, revealed that the alligator closest to the canoe was not the met, so much as condition on the field, which remains waterlogged. 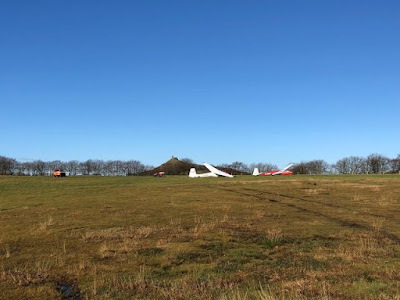 With rising temperatures this would turn from crunchy mud into quagmire, and hence the risk of damage to the ground or the winch becoming bogged down if we attempted to move it from its ‘safe haven’ to the east end of the airfield was assessed as being too great. Which was, indeed, a shame, as Ed Borlase’s photos show some interesting cloud formations which could have been explored had conditions on the ground had allowed us to get into the air, at least early on in the day. Some interesting cumulus at the east end, looking NE. 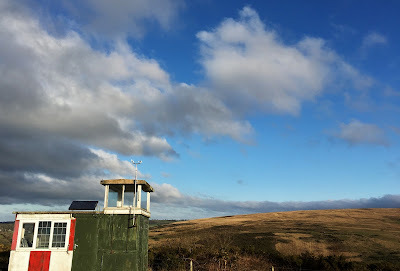 Cap cloud over the western fringes of Dartmoor. After beating a tactical retreat to the clubhouse, we worked on aspects of the Bronze C for Ed’s benefit, before the howl of the wind through the trees confirmed the increase in gusts and overall windspeed and hence our eventual departure. 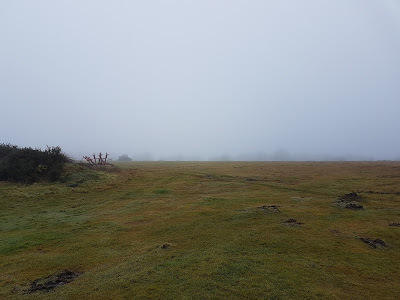 Wednesday dawned bright and blue in some places but not on Dartmoor where you needed an IMC rating to drive your car to the airfield in thick mist. The Wednesday regulars were undaunted. The sorcerer and his apprentice (Colin and Dave) duly arrived at DGS and got the fire going and a brew up. 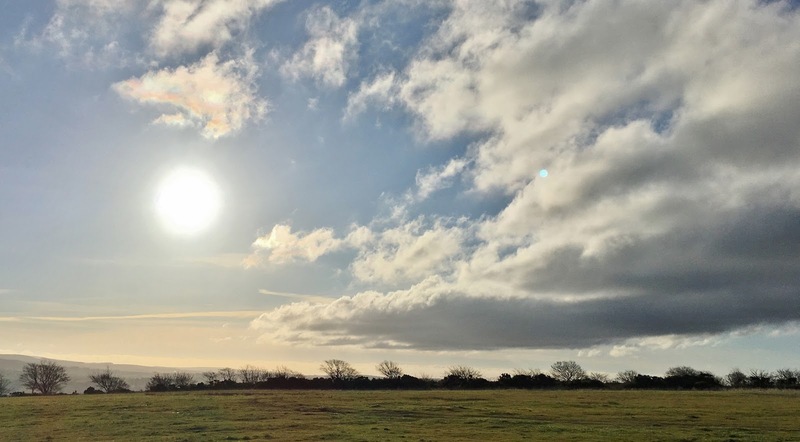 After discussing various complex subjects we looked again at the weather and decided that the cloud base was definitely lifting and the sun was peaking through the clouds. 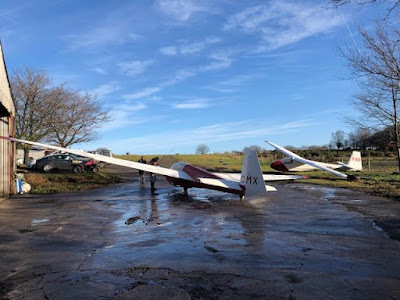 Colin and Dave departed for Okehampton to buy widgets and thingymebobs for fixing things while the rest of us finished our lunch and then decided to set up the airfield and get the K8 out in the hope that the weather would improve enough for us to fly. After getting the cables out , DIing them and the winch then taking the fence down our spirits were lifted when the cloud based looked about 600feet above the airfield. Things were definitely looking up, time to get the k8 out. After completing the daily inspection and pumping up the tyre, we looked up at the sky to see how much things might have improved. Unfortunately the sky looked darker and then some light rain drops dashed our failing hopes so we put the k8 back in the hangar and packed up the field. The weather closed in and we all went home! We tried! New Year - new challenges? No, same old ones. The previous week has been very, very wet culminating in monsoon like conditions on Thursday as the latest named storm passed by. The airfield is as wet as it can be. 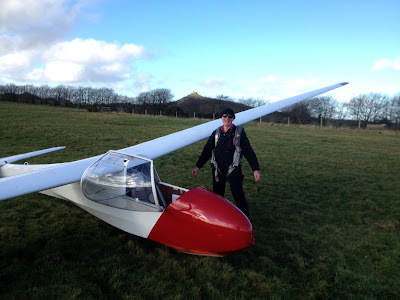 So, in one way, the decision not to fly was easy, but with the wind in the east, and signs of wave in the sky the decision was made through gritted teeth. The small, but beautifully formed, group today did what they do in these circumstances, they got on with things. 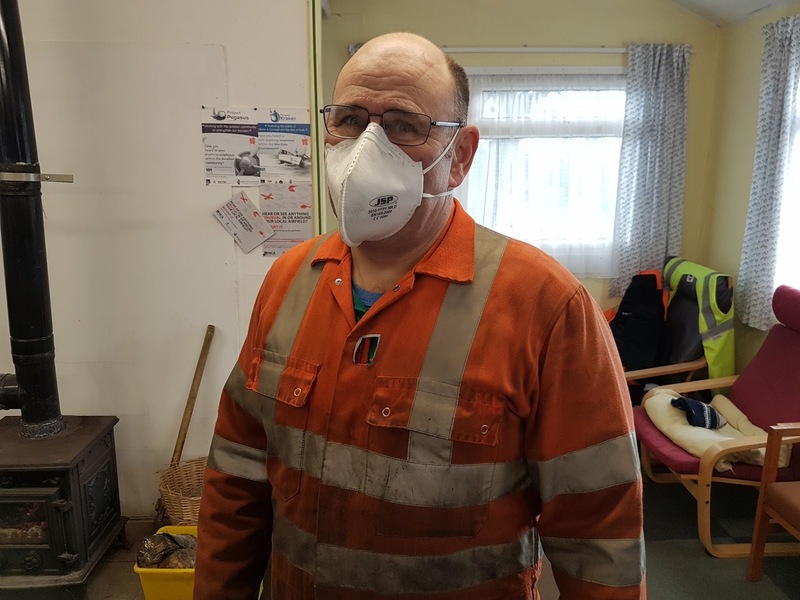 Mike spent his day doing a mock Bronze "C" exam and studying for the exam next week. 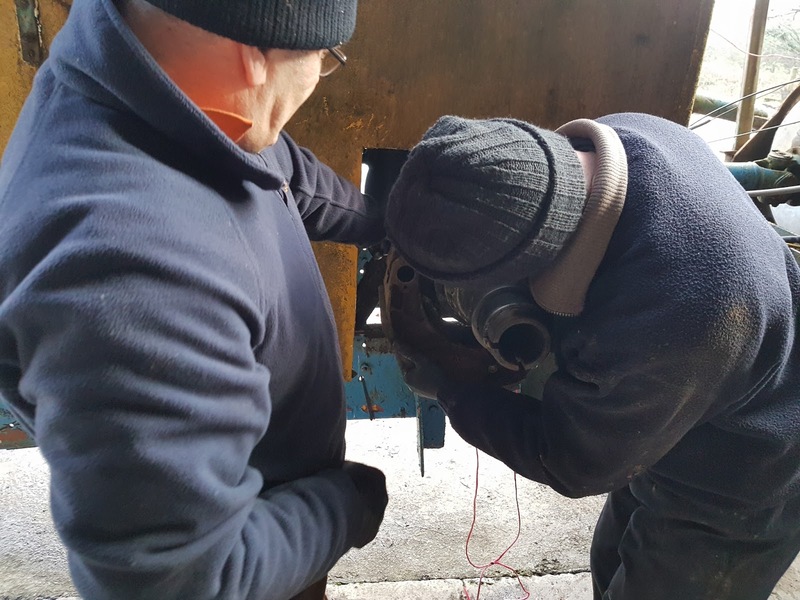 This provided a few challenges for the more experienced members as well. Rick ready to service the winch! !